After all the analyzing, planning, digging, weeding, pruning, and mulching since first contemplating back in January a renovation of the garden, today was a fitting time to settle back and enjoy, relax, and appreciate the plants and the setting. Though the to-do list remains a long enumeration, today was a chance to observe and to just be. The quiet evening air was punctuated by the sounds of cardinals and robins conversing through the neighborhood as a mourning dove, chickadees, sparrows and a towhee flitted about the garden. The sun lowered gently, highlighting along the way a certain branch of the dogwood, then focusing on several iris stalks to form a tiny vignette. 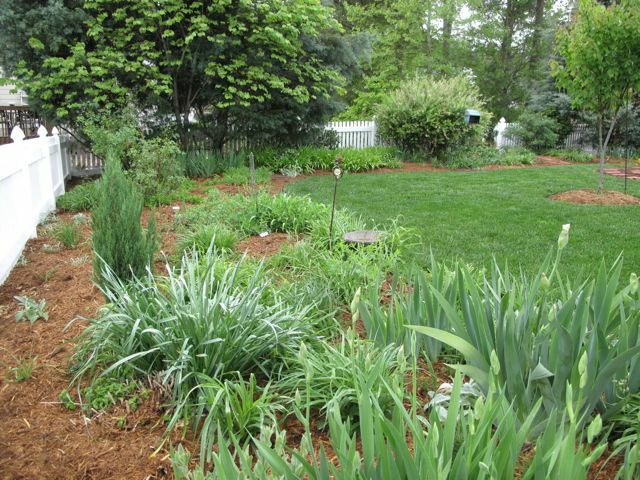 The rains last week and this spring in general have ensured a verdant lawn and vibrant garden scene. 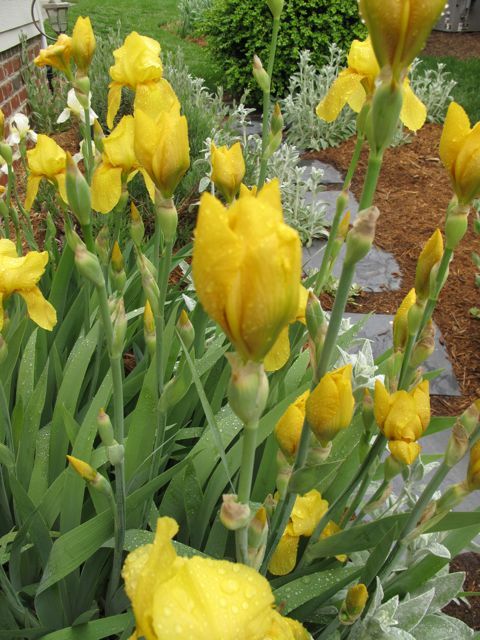 Looking into the garden one sees white bearded iris standing tall and erect. 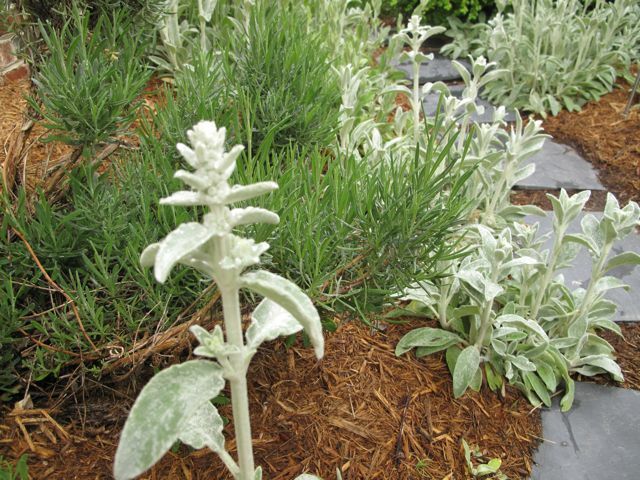 Nearby the eye is drawn to the deep blue of meadow sage, but soon there will be competition from drifts of lavender Phlox divaricata (woodland phlox). The dogwood dropped the last of its petals this week after its best blooming year yet. Nepeta (catmint) is opening beneath Lynn’s iceberg rose, which is full of buds and the old-fashioned rose has a few pink flowers already. Both clematises are strikingly beautiful. 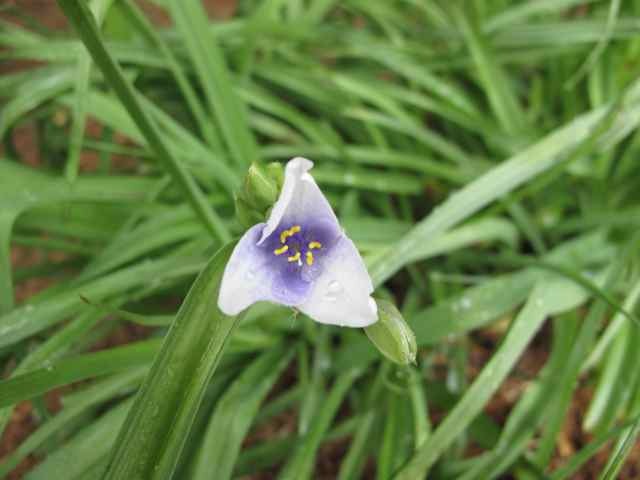 This one is Jackmanii, growing just outside the new gate at the southern side path. 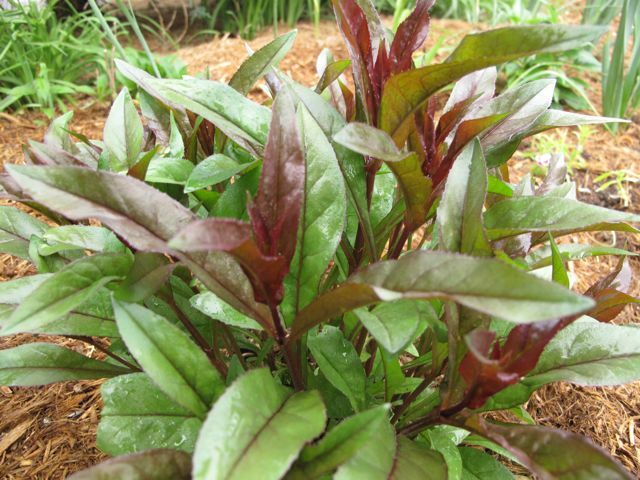 The penstemon forms a nice clump and displays rich green and red-hued foliage. Penstemon seems like a good candidate to use in the meditation garden. A visit to the garden center this week may offer up other ideas. 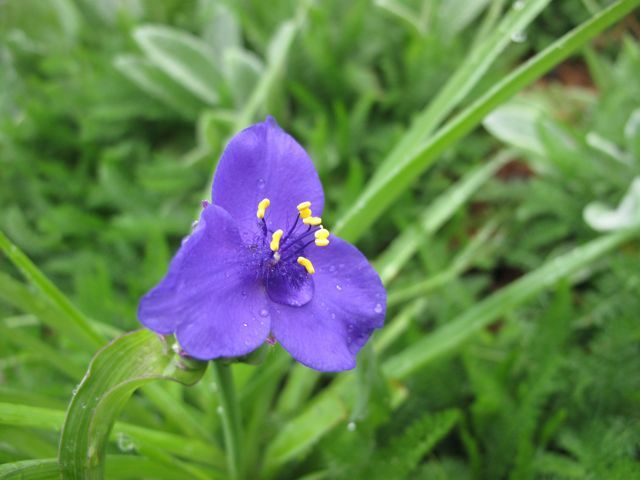 Tradescantia (spiderwort) is a cheery, nostalgic favorite from childhood. 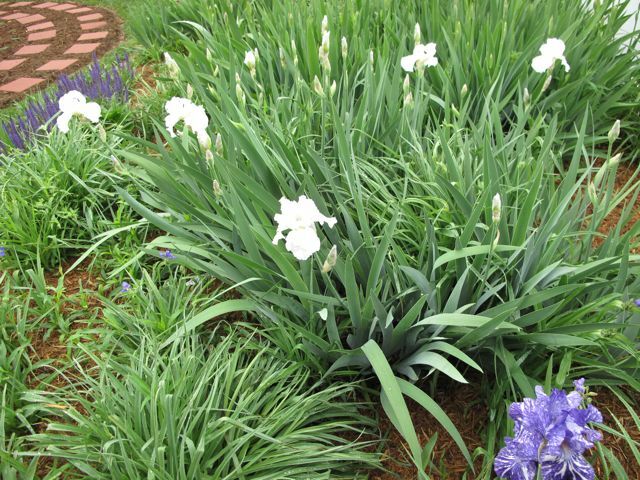 Although it tends to move itself around the garden too freely, it is easily one of the most welcome plants in this garden. Along the side path grows lavender and another old-fashioned flower, rose campion. Neither is blooming yet. 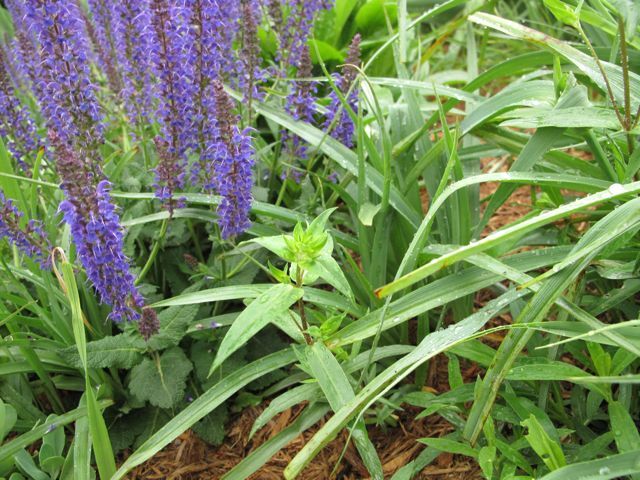 Returning in this same part of the garden is monarda (bee balm), lamb’s ears, and a lovely stand of yellow irises. Tomorrow chores await but today in the garden, there was time to just enjoy. 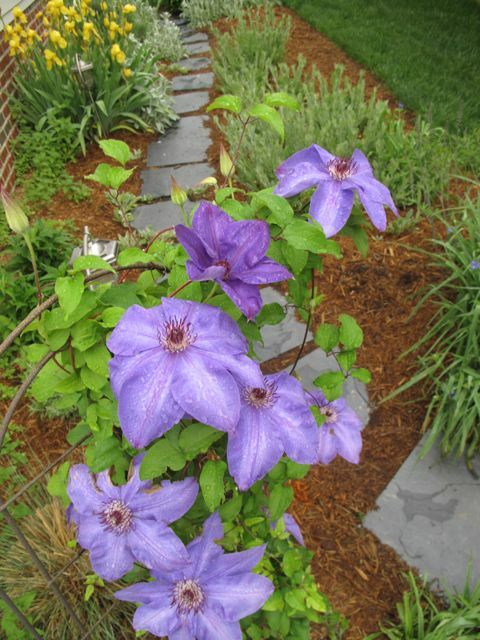 This entry was posted in garden, pbmgarden renovation and tagged clematis, garden renovation, iris, meditation garden, pass-along plant, penstemon, rose campion, spiderwort, tradescantia on April 24, 2011 by pbmgarden.